Even though I live in Spain, where it was Mother’s Day last Sunday, I still celebrate the day at the end of March, at the time of Mother’s Day in England, because that’s where I’m from and my family live there. But, I know that many of you are celebrating Mother’s Day today, so I’ve got a real treat for you. Last week I visited Cordoba, one of my favourite cities in Spain, for the annual Patio Festival (La Fiesta de Los Patios de Cordoba). The old part of the city consists of narrow cobble-stone streets with the houses white-washed to keep them cool during the very hot summers. Many of these old houses or apartments are situated around a private, interior courtyard accessible only to residents. The origin of these courtyards can be traced to Roman times, when the courtyard (known as an atrium) was a place where rainwater was collected. Later, the Moors who dominated this area of Spain for so long, made the courtyard a much more social space. They planted vines so that their branches could offer shade during the very hot summer months, and pretty water features and pots of flowers were added making the patios a place where neighbours could get together and enjoy the cooler temperatures. Of course, these courtyards or patios form part of private houses, so are normally closed to the general public. 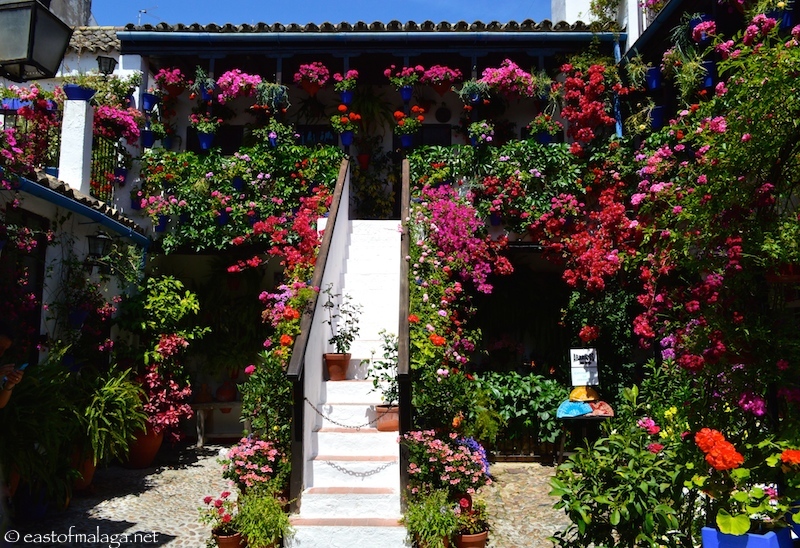 But, for two weeks in May each year, as families compete for the most beautiful patio in Cordoba, they are thrown open so that members of the public can visit each of these patios. 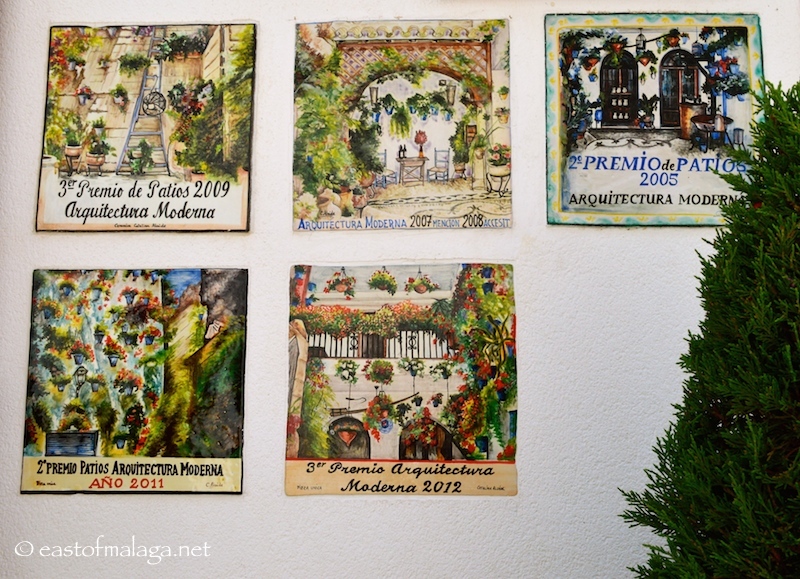 A few have plaques on the wall outside, announcing their previous successes in the Patio Festival, but all of the competing patios are identified by two little conifer trees in red pots outside the gate. All, but one or two of the Patios are FREE to visit, though a small donation is appreciated (but not obligatory) as you leave. Bear in mind that Los Patios de Cordoba is a very popular (and famous) Festival in Spain, with hoards of tourists – both international and local – descending on the city every day. Weekends are especially busy, and a free ticketing system has now been established, to enable some semblance of order and safety when visiting the often tiny patios. (See link below to get your free tickets). You can collect a map from the Tourist Office, on which six colour-coded routes to visit are identified, each with between 8-12 patios to visit. (See link below to download a map). The competing patios are open from 11am – 2pm and 6pm – 10pm each day from 5th – 18th May 2014. How would you fancy watering all these pots? This entry was tagged Andalucía, Cordoba, culture, customs, Europe, fiestas, flowers, garden, gardening, gardens, photography, Spain, travel. Bookmark the permalink. I had heard about the patio festival and thought to check back on your blog to see if you had gone…. What luck! 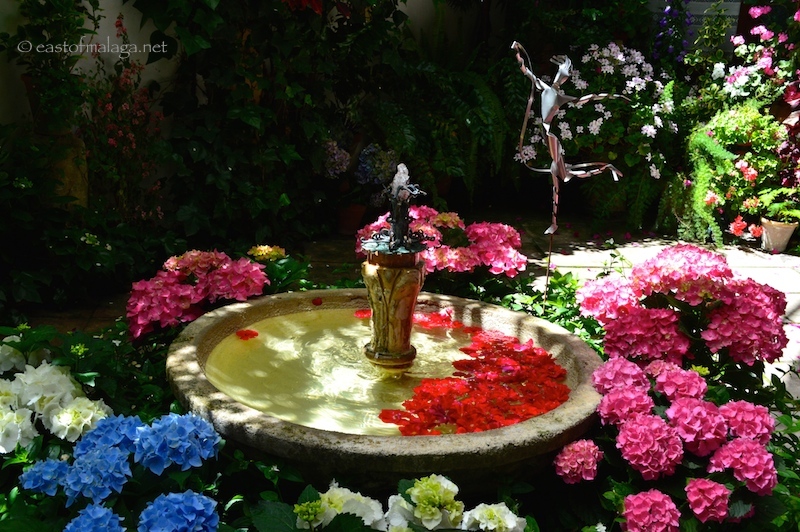 Thank you for the beautiful photography, the gardens are absolutely stunning…. WOW! Thank you Thank you Thank you! I really appreciate your effort on this wonderful blog. What a lovely thing to say, Janine. Thank you for your kind comments. I’m so glad you enjoyed my photos. Wow, Great post with the different colors of flowers.! Thanks for sharing on the web. What a glorious post Marianne!!! Yes, there’s the rub – all that watering, but oh, what a glorious display. Thanks for your comment – much appreciated! When I move to Spain (which will be soon) I must take this event in. Thanks for telling us about it. The photos are stunning. Stunning! The patios and your photos! Thanks for this incredible tour, Marianne. I am going to post a link to your blog on mine today as it will be simply a pleasure to share the experience you have gifted us here. I love Cordoba but have not been there when this festival is on … now I feel, at least somewhat, that I was! OOHHHH you MUST go – yes, this weekend is the last one. Remember you need a ticket if you go on a Friday, Saturday or Sunday (link on my post) but they are FREE! I love it, Marianne! When I lived there I was lucky enough to live right in the hub of the patios! I just loved how proud everyone was of their patios, and rightly so with all the effort they put into them! I have to say I really enojyed this post! Great job capturing the spirit! I’m not sure I would enjoy the extremes of summer and winter weather in Cordoba – but I DO love to visit for a few days, each year. Like you, it’s wonderful to see how proud everyone is of their patio …. something that’s often missing these days. I would love to get my balcony geraniums to grow like that 🙂 I love the drawings on the wall plaques commemorating past successes. And the purple passionfruit flower. We have white which actually turn into passionfruit, and a rampant red ornamental version. I think this is my favouritest festival I have ever seen, and it’s free. I’ll let you into a secret, Ella – I can’t get MY geraniums to bloom like that either!! I know the type of passionflower you mean – I have one too (and a purple one – but slightly different from the Cordoba one). I used to have a red ornamental passionflower that we bought from the National Passionflower Centre near Bristol, England, when I lived there – but it didn’t last long. What a great tradition and friendly competition as well. I can see why it is so popular. I would gladly buy a ticket. I last went to the Patio Festival in 2008 – and I can’t believe how some of the patios have “come on” since then. I think they must be using Miracle Grow!! It is indeed amazing – haven’t been for a couple of years, so this bought back some lovely memories! Thanks for your visit – and Happy Mother’s Day, Sylvia. The Patios really are breathtaking – what’s amazing is that when you’ve seen 30 different ones – it’s easy to walk into the less decorated ones and not be impressed! Some are just unbelievable! Mouth dropping gorgeous. How many ways can you decorate with flowers, and outside at that. This is a delicious tour. I absolutely love this. Well, I know they are watered via long watering tubes with a curved end (a bit like a long shepherd’s crook) – but what puzzles me is the lack of dirty dribbles all down the wall. I love those patios and the history of the courtyard is interesting too. The fact that they were instituted to collect water tells me just how hot it gets there and how difficult it must be to keep all those beautiful plants in top condition. Oh to have just a little of that sun in Ireland right now. Can we swap it for some of our rain please? That is so amazing, Marianne! Patio festival, WoW!!! 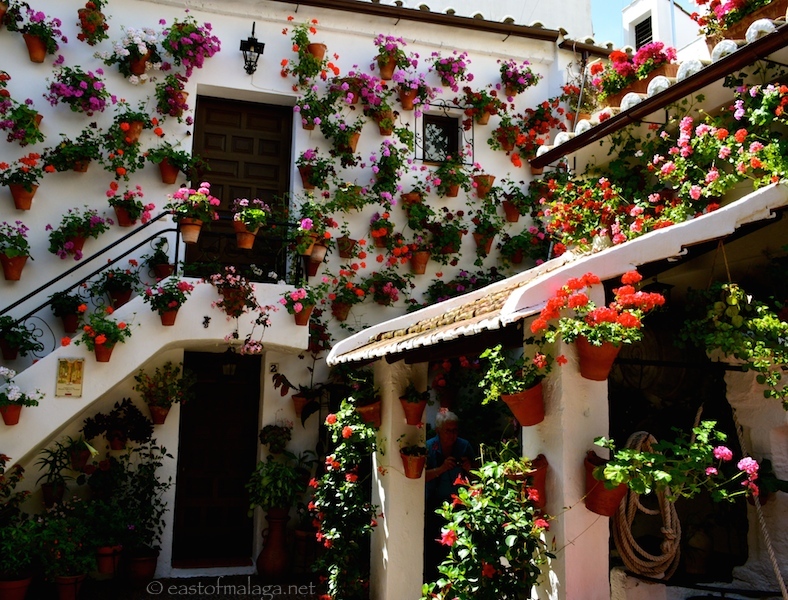 Check out these great photos of one of my favorite cities in Spain. Happy mother’s day! yowsa!! a perfect mother’s day gift. thank you, I accept 😉 gorgeous photos! and useful information too. so, if you want to beat the crowds of tourists, when’s the best time to tour the patios during the festival? I definitely wan to go to this festival!! I would say hit the Patios as soon as they open at 11am, and go midweek. It will still be busy though. What a stunning explosion of colour! Toledo is doing its patio thing this week, but I think I shall give it a miss this year. You’re not missing much… I head that only 13 were participating this year! Oh and I loved these…what a feast of colour. I can’t tell you how many photographs I took, Jo!! I can imagine Marianne…I can imagine. These private areas are absolutely stunning and I too wondered how they would stop the dirty drip marks down the walls? ….and May is the perfect time to visit – not only for the flowers, but because the weather is perfect. It gets just too hot in the summer. Wow, I love the pots all over the walls. Last year we visited the Stoopa this year we may drive up to Cordoba (next month). How long do you think it would take from Velez. Thanks for sharing, a nice way to brighten up a dull Sunday morning. Wonderful, but good heavens imagine having to water all the pots in some of those patios! I know ….. just can’t imagine the work involved! OH … I forgot about the dead-heading!! The patios look delightful Marianne. No wonder you like to go but oh, what a lot of work it must entail. You’d need a watering can strapped t your arm for 12 hours a day with that lot. They have long, extended watering tubes, with a curved end to be able to reach the pots – but they must dry out again quickly because it’s so hot. It was 34C when we were there on Tuesday and Wednesday! And – I wonder how they stop all the soil and water from dribbling down the walls? You must ask them sometime. Cordoba is a stunning city. Hope you get chance to visit someday. 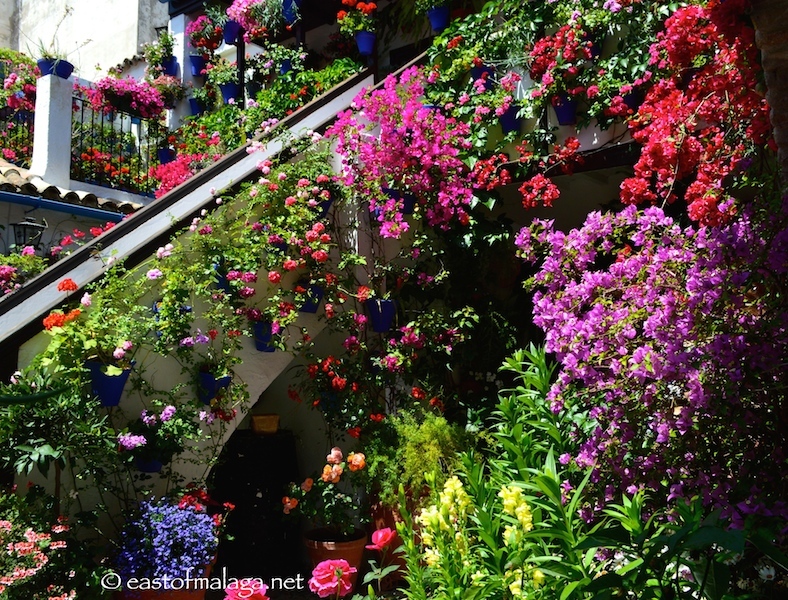 From Marianne in East of Malaga…a Mother’s Day Feast for your Eyes!